Complete the form and click submit to receive notice on how to access for free. Marked fields * are required. We will Email you the schedule and access information starting 60-days prior. Questions? E-mail us signup@insuranceexpos.com or call 818-597-3205. 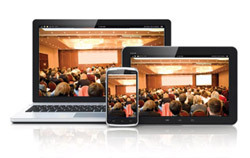 By registering, you will have access to a stream of sessions broadcast live from the 2015 Medicare Supplement Sales Summit. Access information will be sent to the Email address you provide. Sessions are streamed live. You can watch as little - or as much - as you like. The following is the session line-up and times. Four (4) hours of program will be streamed live from Orlando. With one click on the link we'll send you, you will be able to watch the free live program stream at anytime during the free broadcast. EXCLUSIVE FOR ONLINE VIEWERS: During the broadcast, you will be able to post questions for our CEO Panel (2:45 PM) and our Top Med Supp Producer Panel (3:30). Don't miss these two great sessions! The Medicare Supplement Insurance CEO Panel - Heads of Leading Med Supp Insurers will discuss the future of the industry. Online viewers will be able to submit questions via our LIVE CHAT feature. The 7th National Medicare Supplement Summit is the only national event 100% focused on Medigap.